Lifting eleven (11) roof mounted exhaust fans weighing over 1500-1800 pounds each to the roof for placement. Our Cleveland office was hired to replace over thirty (30) fans for their manufacturing plant located in Aurora. Eleven (11) of them were to be roof mounted and were the size of a small car. Due to the roof location and the weight of the units, a helicopter was used to air lift each unit to four (4) men waiting on the rooftop. 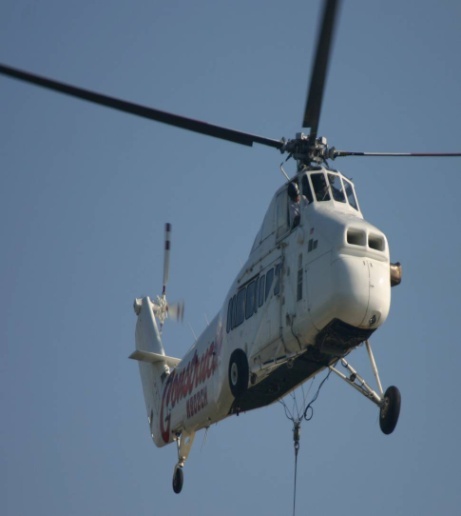 The helicopter lifted each unit and set them in place in 25 minutes! Rotek is a world leader in engineering, manufacturing, service and support of large diameter slewing ring bearing and seamless rolled rings. With new roof fans that are 66 inches wide and constructed of steel, we decided to use a helicopter as the most economical and efficient way of installing them. With a small crew on the ground and on the roof, each fan was lifted and placed on its curb under the direction of hand signals.